MCB Arif Habib Savings arranged an activity at the SOS Village Karachi to pay tribute to their 'House Mothers' and to spend quality time with the resident children. The session was aimed at gaining an in-depth understanding and highlighting the lives of these mothers and included fun filled activities for the children. 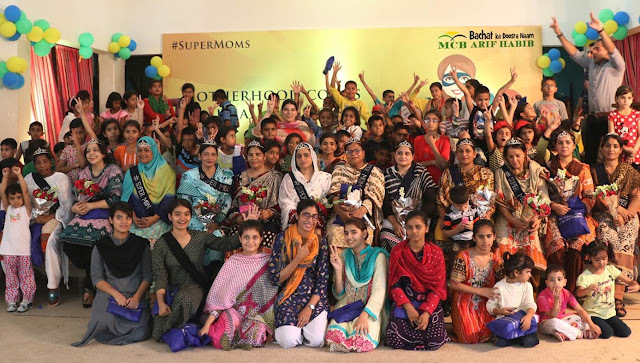 Karachi: MCB Arif Habib Savings recently arranged an activity at the SOS Village Karachi to pay tribute to their 'House Mothers' and to spend quality time with the resident children. This being part of the Mother’s Day celebration was a means to encourage employees to play their part into becoming socially responsible citizens thus getting acquainted with life at the SOS Village. The daylong session had a number of interactive activities planned that aimed at keeping children entertained while also paying tribute to the persevering housemothers who are assigned to run each household at the village. The fun filled activities included musical chair, face painting, magic show, and a singing competition to name a few. Staff members of MCBAH who volunteered to be part of this activity visited the different households and gained an in-depth perspective of life happening at each house where children study, play, grow plants, and assist their mothers for their daily chores. They also spoke to these housemothers’ to gather insightful information and successful stories of motherhood that is a norm at the SOS Village. They paid tribute alongside the children to these mothers through various other activities, also by awarding the Super Mom sash to mothers which was followed by a cake cutting ceremony. MCB Arif Habib Savings and Investment Ltd is a result of a strategic merger between two leading Asset Management companies of the country, created in June 2011 when sponsors of Arif Habib Investments Ltd and MCB Asset Management Company Ltd decided to join hands. Carrying the trust of more than 70,000 investors, MCB Arif Habib Savings and Investments Limited is one of the pioneers and innovators for many firsts, as an Asset Management, Investment Advisory and Pension Fund Management Company, managing Open-end Mutual Funds and Pension Funds amounting to over Rs.71 Billion (as on 30 April 2017).